Naturally, no one objected that Czech beer tastes better than most American beer. 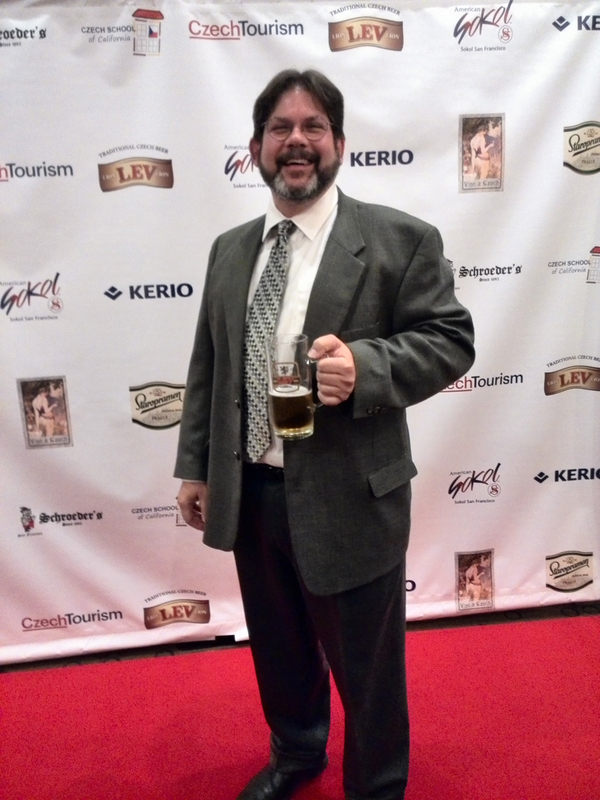 Jonathan Penn, from AVAST, on the 'red carpet' holding a Czech beer. AVAST was invited by the Czech School of California to participate in a panel discussion on Saturday 9 November about Silicon Valley Trends for 2014. The panel consisted of three successful Czech companies operating in the US and featured Jonathan Penn, Director of Strategy from AVAST, Martin Viktora from KERIO Technologies, which distributes software that allows businesses to connect, communicate, and collaborate securely, and Hubert Palan from GoodData, a nextgen data analytics company. The panel was moderated by Czech Ambassador Petr Gandalovič and drew several questions for AVAST around online security and cyber crime from the interested audience. One member asked for AVAST’s tips on how the audience would be able to better protect themselves from online security threats. Jonathan cautioned to be wary about things that may seem unusual or that cause worry as well recommended the audience install an antivirus software on their PC, Mac and mobile devices saying the current themes in security tend to concern privacy issues. Panel discussion covered thoughts on benefits and challenges of being a Czech company in the United States where all three speakers spoke of the advantages of having talented Czech engineers working for them. It was noted the Czech Republic is renowned for its strong grounding in math and science and provides highly skilled software engineers. Company and job loyalty and a lower cost of wages comparable to living costs were also noted as providing significant advantage in the context that Silicon Valley is full of start-ups where company loyalty is fickle and employee salary expectations higher. All agreed their companies were adept at collaborating diverse perspectives with a world view that they saw as an advantage to their company’s business edge. Disadvantages were cited in terms of the time zone difference that can make contact with people challenging as well the need to travel long distances for face to face meetings. They all saw a bright future for their company’s success in the US and predicted more Czech companies will begin to realize business success and growth in Silicon Valley. More than 60 business people, with an interest in the Czech Republic, attended the panel session. Deviating from the standard dress standard one grows accustomed to seeing in Silicon Valley (jeans, sweatshirt and sneakers), the guests looked smart and elegant dressed in black tie for the inaugural Czech Gala Event that followed the panel. The Gala celebrated the best of the Czech Republic in California and was to honor the former U.S. Secretary of State, George P. Shultz, the highest award of the Czech Ministry of Foreign Affairs for his role in implementing foreign policy that led to the conclusion of the Cold War. The Gala was a benefit for the Czech School of California, headquartered in Palo Alto, California. The School, which opened in 2012, is the largest accredited Czech charterschool in the US with four Bay Area locations. Both the Panel and Gala were held at the Crowne Plaza Hotel in Foster City, California. Photo - L to R: Moderator Czech Ambassador Petr Gandalovič with Martin Viktora, The Founder and Chief Technology Officer, Kerio Technologies; Jonathan Penn, Director of Strategy, AVAST; and Hubert Palan, VP of Product Management Good Data wearing their 'CzechTech.net' vests presented by (far right) Richard Pivnicka, the Honorary Consul General of the Czech Republic in San Francisco.